Then ... Helen wants to find out more about Marty and his relationship with Sam so she arranges to meet him in town. Based on the window view looking east to the Bay Bridge they can only be at the Fairmont hotel atop Nob Hill. The same view was seen in the movie The Lady From Shanghai, below, released the same year. From Nob Hill Sacramento Street runs down through the financial district just left of center towards the Ferry Building. and Now ... in the Fairmont view today new highrise offices have replaced or hidden most of those buildings but the bridge is a constant and some of the foreground buildings are still there in Chinatown at bottom left. The two tallest structures in the city are at far left (Transamerica Building) and far right (the formerly named Bank Of America Building at 555 California Street). Now this is interesting ... Here's an earlier scene in the movie at the Mark Hopkins Hotel - in the window view the position of the Ferry Building tower relative to the bridge's central caisson is slightly different from the Fairmont's view (compare it to the top image), consistent with the one block separation of the two hotels. But the waiters in each scene are wearing the same uniform (one waiter looks fatter than the other) and the potted plants are the same ones! Clearly both scenes were filmed in the studio on the same soundstage but with different background projections setting their location. Then ... Helen next arranges a meeting with the detective Arnett. She is torn; on the one hand she had tipped Arnett that Marty had visited Sam, on the other she wants to prevent Sam's arrest for murder. 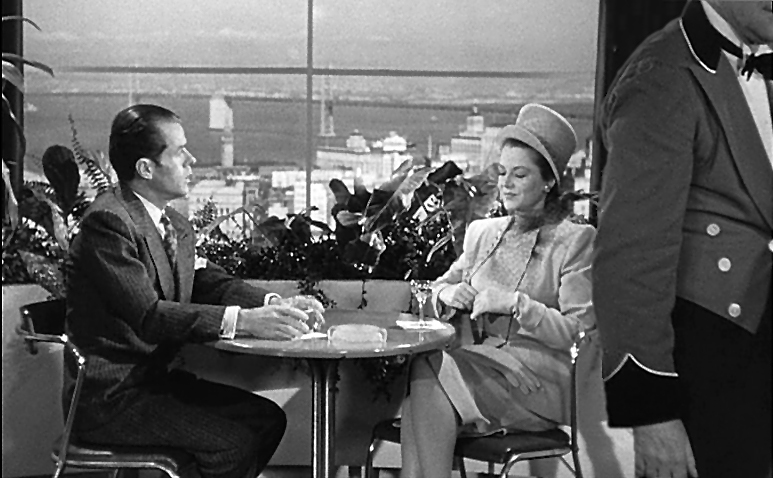 They meet at a lonely spot near the Bay Bridge and once again Helen is wearing a stylish outfit (For a droll look at her wardrobe throughout this movie go here). and Now ... 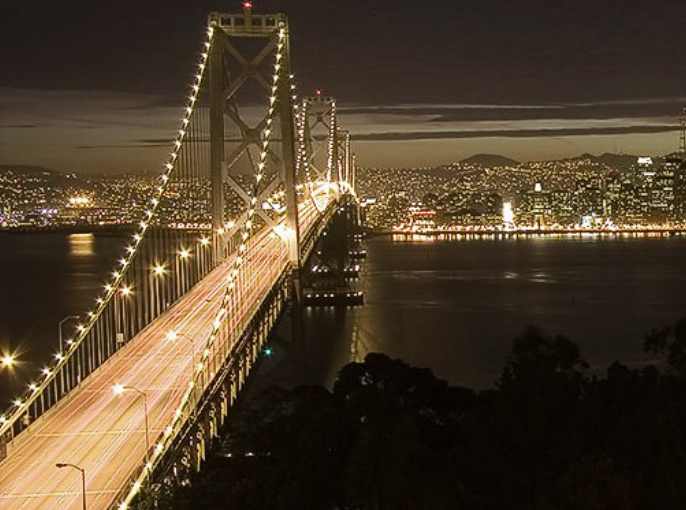 This view of the bridge is from Yerba Buena Island to San Francisco glittering across the bay. The scene took place in the studio using a background projection filmed from an access ramp alongside the bridge (map). "Has it occurred to you, neither of us looks like a scoundrel ... do we?"